Burning Bush is a unique shrub whose leaves turn firey red in the fall. You can plant it in rows to make a hedge or on its own. 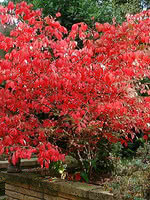 Burning Bush requires little maintenance and thrives in just about any kind of soil, which makes it a good choice for inexperienced growers. Plant it in full sun to get its best fall color. Note: Burning Bush is considered an invasive species in eastern North America. Please plant the right tree in the right place.